Local developer Patrick Coutu gives James Currie a lot of credit for seeing the potential in an old building. “He signed a letter of intent when this place looked very different,” Coutu said of the project he undertook at 117 Christina St. with partner Jim Pumple. Currie plans to open his new Hawg Bar in a few weeks after a complete renovation to the lower level that includes an 18-seat bar, three fireplaces, private dining room and a unique lounge area that overlooks the St. Clair River. He’ll be licensed to seat 140. 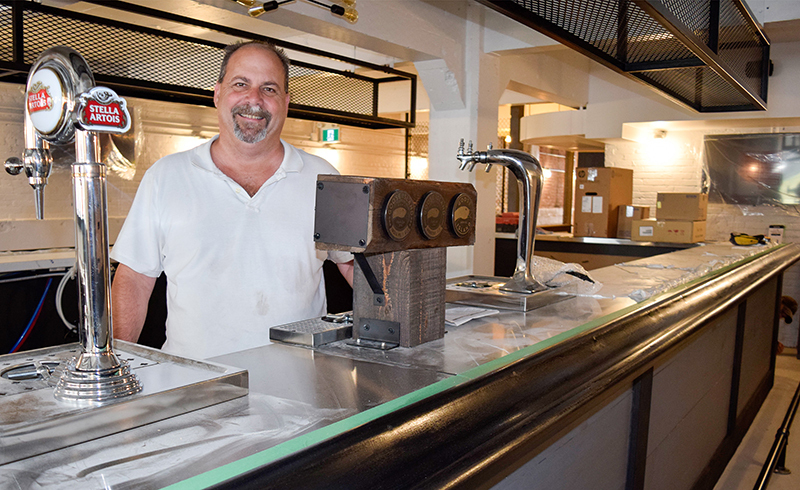 “It’s a great location and makes a lot of sense for us,” says Currie, who also owns Smoke & Spice Southern Barbeque at the Lambton Mall. He said The Hawg Bar will be something different for the downtown, offering a few of the same barbecue pork and chicken items as Smoke & Spice, but also focusing on munchies and wraps for the theatre crowd and lots of late night bar foods. Currie said he’s lowering his prices slightly at The Hawg Bar. Redneck nachos, for instance, will sell for $9.99. Smoked wings cost $19.99 for 20. Various kinds of burgers sell for $11.99 to $15.99, and a pulled pork sandwich is $12.99. There is also an assortment of pastas and sandwiches. A Chinese food restaurant was located in the same spot for years, but the space is unrecognizable. The walls were stripped to their studs and every appliance replaced. Probably the most unique feature is the lounge area built on the west side with two fireplaces, couches, coffee tables and a glass garage door for enjoying the river view. Currie plans to add an outdoor deck next summer. He and a silent partner opened Smoke & Spice in Sarnia a year ago and said they like the community. He believes the downtown restaurant crowd is a lot different from people who go the Lambton Mall area. “We intend to operate both locations because people who go downtown don’t go to Lambton Mall,” he said. Currie has hired 18 employees and is still accepting resumes. He hopes to open next week if all the approvals are in place. The new venture occupies the lower level of the former Greenwood Inn, purchased by Coutu and Pumple last fall. They converted the three-storey building into 22 furnished rooms that rent by the month for $700 to $1,100. Four two-bedroom apartments have been built where the old Liquid Johnny’s bar used to be. The building, which dates to 1911, has had an overhaul priced at about $2 million. “They were all rented before the paint dried,” said Coutu. Transient workers and local residents “between houses” tend to rent the rooms that come with a kitchenette, TV and housekeeping once a week. This month, a rooftop deck is being built for tenants only. “It’s the icing on the cake,” said Coutu.